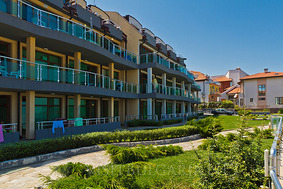 Location: Black Sea Paradise complex is spread on an area of 3000 sq.m. and it just next to the famous beach of Sozopol "Harmanite". Accommoation: The complex consists of many terraced buildings. The Black Sea Paradise complex was built facing the sea so each unit is offering some stunning views to the bay. Every apartment disposes of a terrace with a particularly specified place for a barbecue. There are studios and one-bedroom apartments available for rent at the complex and each one of these units is nicely furnished with everything necessary for your pleasant summer holiday. Entertainment: There are many green areas at Black Sea Paradise, all perfectly maintained. A staircase will lead you to the seashore.